Mid-Century Modern Palm Springs, Para Siempre! After over half a century, the world is still infatuated with Mid-Century Modern architecture, design, and decor. Following an article she wrote for Crown, Cara Greenberg coined the phrase “midcentury modern” for the title of her book, Midcentury Modern: Furniture of the 1950s, published in 1984. This term encompasses the modernist home decor, design, and architecture spanning between 1947 and 1957, although some will say the time period stretches a bit in each direction of time from the 1930s to the 1960s. The architecturally innovative oasis of Palm Springs, California has long been revered as a pinnacle for the Mid-Century Modern style, having the highest concentration of the design in the world. With it’s dramatic geographical landscapes of colorful deserts, striking mountain ranges, and intense climate, architects embraced a sleek, cool way of integrating the homes into the extreme environment. Unlike Los Angeles or Miami, palm trees are in fact native to Palm Springs. After the last ice age, a freshwater lake covered the Coachella valley and created an underground aquifer enabling rich plant life to emerge. The Desert Inn health resort was the premier hotel, opened in 1909 by female entrepreneur Nellie Coffman. Not long after, the hotel with it’s modernistic features complimented by the backdrop of natural wonders, soon made Palm Springs a popular film location, drawing celebrities and filmmakers away from Hollywood to make their homes. Check out the lustrous glamour of these interiors! The details of the sunburst fisheye mirror and clock, luscious philodendron, and cool Caribbean glaze of the floor, make the spaces in these two images have a smooth, natural flow. Bright whites with beautiful blush and brass accents, lined with local plant life. White walls adorned with hexagonal honeycomb mirrors, reflecting sunlight through the leaves of suspended climbing vines in brilliant brass planters. Windows from floor to ceiling, providing bountiful light sweeping over this multi-level lounge, masterfully melded into the natural rock formation. Beautiful blush walls in a pattern reminiscent of topographic mapping, antique brass accents, maple and ash furniture with both geometric and oblong characteristics, and modern art makes this bedroom completely fascinating. The deep moss velvet sofa along with the lavender velvet armchairs create delightful symmetry to frame the unusual love seat. Crisp cobalt lamps and a collection of colorful handblown glass vessels are brilliant accents to contrast the white brick wall. This luxurious living room of pale marigold and turquoise pieces is placed to perfection with walls of windows providing a paradisiacal backdrop. 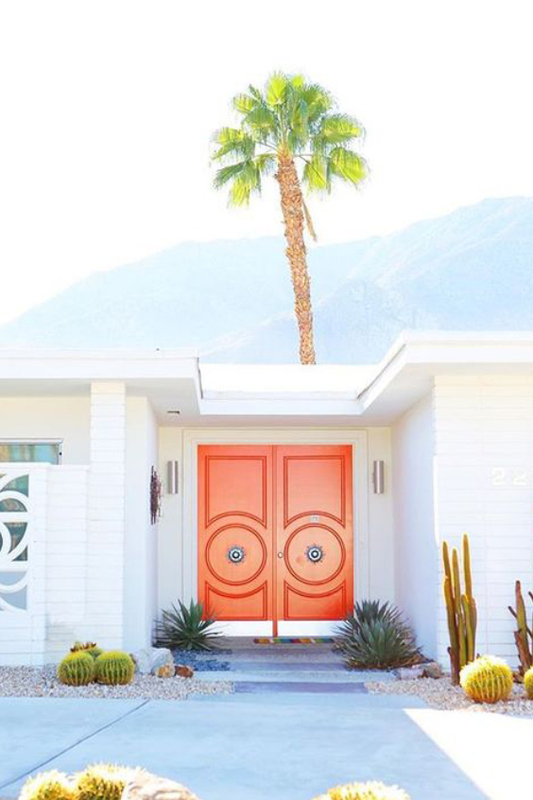 Have you visited Palm Springs or another hotspot for design from this era? Share links to your favorite Mid-Century Modern design and architecture below!